A few months ago, we got “The Little Paris Kitchen” cookbook by Rachel Khoo and after a long summer of not feeling terribly interested in spending time in the kitchen, I’ve finally gotten around to cooking from it – Cauliflower bake with hazelnut crunch crust. I like the simplicity of her recipes and the French flair (Khoo is a Brit who now lives in Paris and adds some Britishness to her French dishes). 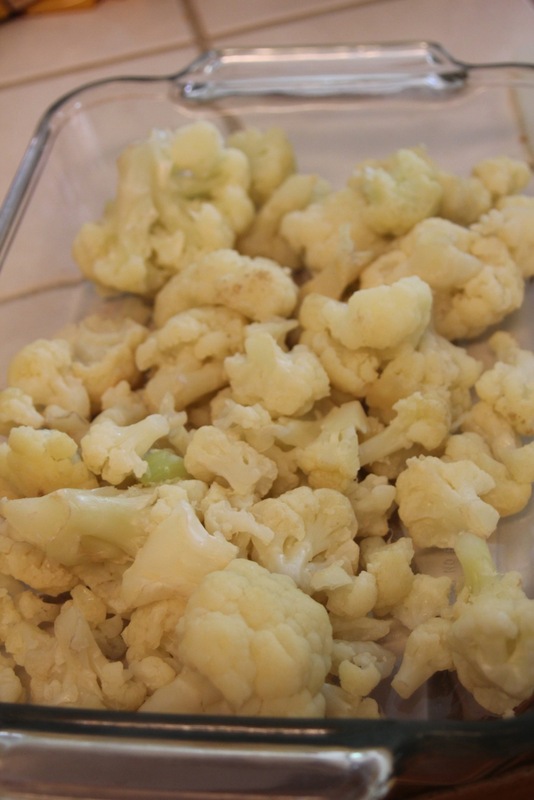 It’s seasonal, fresh and easy and the results speak for themselves – my cauliflower bake was gone in a day and it was a great recipe to get the kids to eat their veggies. If you haven’t seen Khoo’s show before, it’s currently on the Cooking Channel in the states, showing every Friday at 12:30 p.m. EST. To begin with, steam the cauliflower in a colander fitted inside a pan. Steam for around 15 minutes so the cauliflower still has some bite left in it. For the sauce, melt the butter in a medium sized pan. 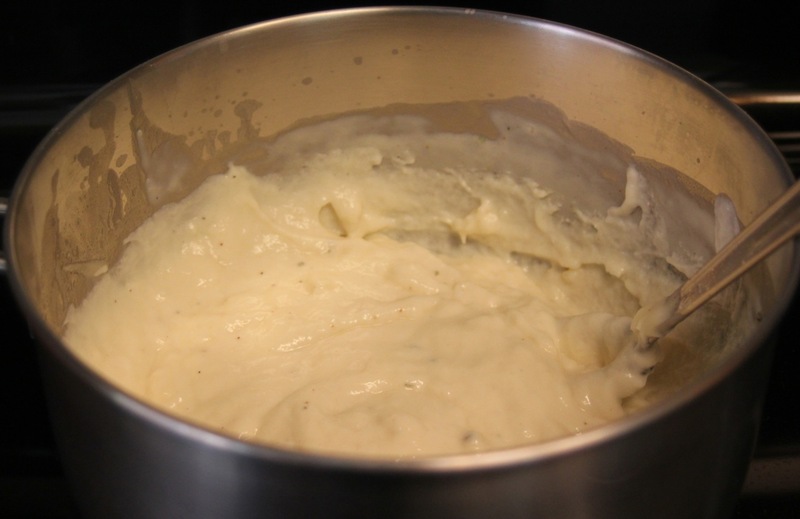 Add the flour and stir hard until a smooth paste is achieved. Take off the heat and leave for a couple of minutes. Slowly add the milk, mixing all the time. Place it back on the heat and add the clove, bay leaf and leek. Simmer for 10 minutes, constantly stirring. Remove the leek, bay leaf and clove. Season with salt and pepper to taste. Preheat the oven to 350 degrees Fahrenheit. Stir the cheese into the warm sauce, saving a bit to sprinkle on top. Mix the cauliflower into the sauce and give it a good stir. Pour into a baking tin. 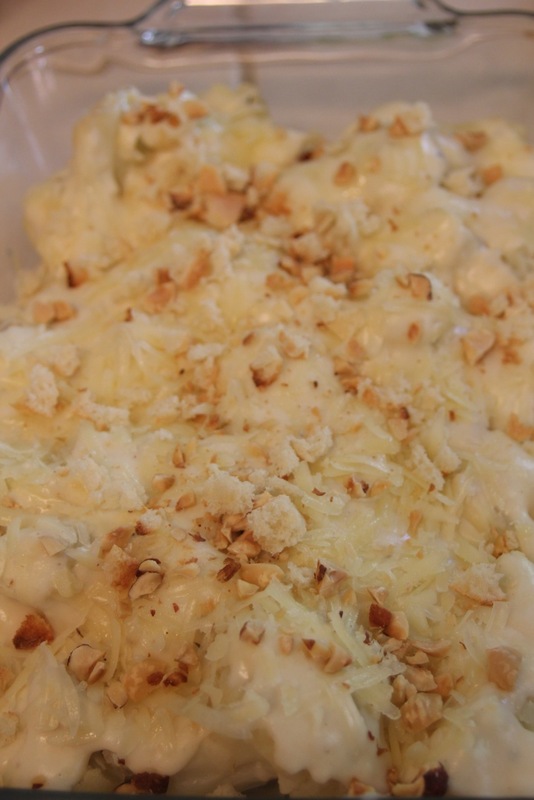 Sprinkle on the remaining cheese and top with the crushed hazelnuts and broken up pieces of toast. Bake for 20 minutes and then place under the broiler for a few minutes to get a golden and bubbling crust. We dug in so quickly after I took it out of the oven that I later realized that I had forgotten to take a photo of this golden brown and bubbling goodness! Trust me when I say it looked and tasted divine!